Geez, after a lengthy facebook conversation I am troubled in spirit. Why? Because I realize so personally how the Christian community has failed miserably to follow the commands of Christ and for that reason, "Christianity" to many is a bad bad word. The feeling of rejection, condemnation and criticism are paramount when many, especially homosexuals, hear the word "Christian". This is NOT what God or Jesus intended. SO what commandment have we failed to follow the most? 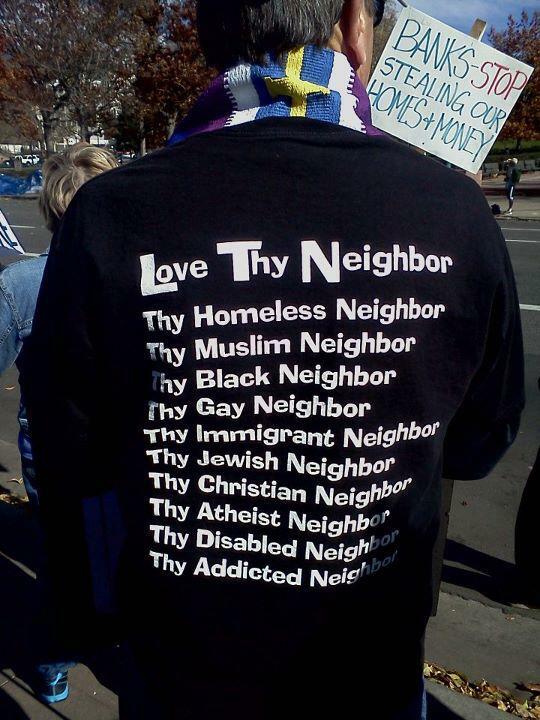 (There are many) but... Love thy neighbor as thyself. Who is my neighbor? It could be anyone. A black man or woman, rich or poor, someone uneducated, someone old, someone with HIV, someone with an STD, a muslim, a buddhist, a foreigner of any origin... Do we get to pick and choose our neighbors? Not so much. Do we get to pick and choose who God was thinking of when He said "Neighbor"... I don't think so.. Did He mean the neighbors that live right beside you only, or the ones across town? Did He confine "neighbor" to only the ones that speak your same language, figuratively or literally? I don't think so... So what was intended when the word "neighbor" was used in the translation of the original Hebrew text? The word is actually "rei-acha" and refers only to Jews. This view is supported by the context in which the phrase appears in the Torah, which can be translated as follows: "You shall not hate your brother in your heart. You shall not take revenge or feel resentment against the children of your people, you shall love your companion (rei-acha) as yourself" (Leviticus 19:17-18). Looking at this, it seems clear that "your companion" falls into the same category as "your brother" and "the children of your people," all explicitly referring to one's fellow Jew. According to this view, "Love your neighbor as yourself" does not refer to anyone outside the Jewish people. "Neighbor" is not an accurate translation for the word rei-acha. The Hebrew word for "neighbor" is shachen; the Hebrew word rei-ah means "a very close companion." Sometimes rei-yah is used to mean "spouse." So who are our "neighbors" or "close companions" today? Are they only our fellow Jews? Can we extend the meaning to include "human beings" in general as our companions in our country or in the global village? Or is this too much to ask? 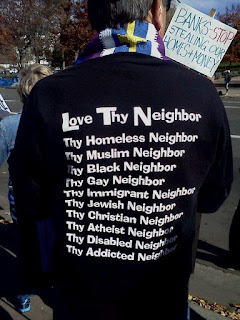 Can we further expand on this to say that if the Jews were commanded to love the non-Jews, shouldn't we as "Christians" love non-Christians if in fact that is how we see others, even our "neighbors"... I mean what is the purpose of being a "Christian" if we can't have love for non-Christians? It doesn't matter what we conclude to be the deciding factor of their Non-Christian status, i.e. their sin, perceived or otherwise. Isn't it Love, i.e. God, that transforms us? So in our expression of this Love, God within, that would transform others? If we act without Love, then we are acting apart from God and the Truth is not in us. I John 4:8(NIV) "Whoever does not love does not know God, because God is Love." If we are to be true disciples of Christ we must follow his commands and one in particular that relates to this topic as seen in John 20:21-23(KJV) - 21 Then said Jesus to them again, Peace be unto you: as my Father hath sent me, even so send I you. 22 And when he had said this, he breathed on them, and saith unto them, Receive ye the Holy Ghost: 23 Whose soever sins ye remit, they are remitted unto them; and whose soever sins ye retain, they are retained. Let us treat our neighbors as we would ourselves, let us love one other forgiving each other of our sins, and let this "Love" transform us in our giving and receiving of the same.